These, it turns out, are the first seven "happy numbers"— something I'd never heard of either before undertaking today's assignment. Did you get that? Take a number and square it. Break the resulting number into individual digits. Square each digit and add them up. Repeat for the resulting sum... and do so as necessary until (quoting now from the Wikipedia entry) "the number equals 1 (where it will stay), or it loops endlessly in a cycle which does not include 1. Those numbers for which this process ends in 1 are happy numbers, while those that do not end in 1 are unhappy numbers. I had never heard of Happy Numbers, either. The post reminded me of the Collatz Conjecture. I first heard of this conjecture in Godel, Escher, Bach by Douglas Hofstadter. Hofstadter calls these numbers Wondrous Numbers. Take any whole number and apply one of these two rules to it: if the number is even, cut it in half, but if odd, multiply it by 3 and add 1. Whatever number results from this, apply one of the two rules to it. Do this again and again and you will notice something odd happening to the numbers that you get. Cut The Knot has a fun applet to help you explore what these numbers. The Wikipedia article about the Collatz Conjecture is detailed and over my head. But at the end is a photo of the Collatz Fractal, which is at the top of this post, by Pokipsy76, who has released the photo into the public domain. Thank you, Pokipsy76. In 2004 John Allen Paulos, in Who's Counting? : Unsolved Math Mysteries, wrote that the Collatz Conjecture is one of "seven important questions in mathematics that have never been answered." He also wrote that the Clay Mathematics Institute has offered a $1 million reward for its solution. However, Wikipedia says that Paul Erdos offered a $500 prize for its solution and never mentioned the Clay Institute reward. After a brief search at the Clay Institute, I can find no mention that this conjecture is one of its Millenium Problems. I end this post with a request: If you are interested in joining a Godel, Escher, Bach Blogger Reading Group, please let me know. I have begun reading this book many times but I want to talk about it with other people as I read. Each chapter is very dense. I know that reading it together will be more satisfying and enlightening. I never read a book such as this with the intention of learning everything there is to learn from it. That is unrealistic. I am satisfied with learning one or two things here or there and with being amazed at the knowledge in the book. Using Blogger labels, we can group posts by chapter and topics. Members of the blog can drop in and out at any time. Any member can post about any topic on the book. Each chapter of the book would have a unique post with subtopics in each chapter referenced by the chapter label. Mathematical intimidation would not be allowed. We'd keep the math level as low as we can go so that we don't scare people away. The blog would be open to the public so that anyone can read and post comments. At some point, we can continue with a new Metamagical Themas group blog. Want to join? Drop me an e-mail with the subject: Godel-Escher-Bach (click that link and an e-mail message addressed to me with this subject will open in your e-mail client). Cool. I was going to do a post on Wondrous numbers (the "3x + 1 problem") at some point. 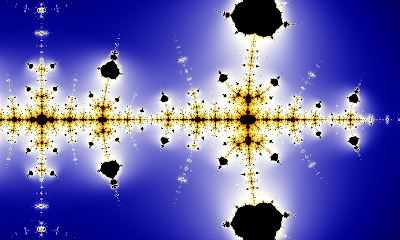 There are some really interesting things I've found about related to fractals and wondrous numbers, who knew? Happy numbers sound interesting as well, though I'm always a little skeptical of things that are based on digits, and thus base-ten specific. Perhaps it works in other bases as well? I have posted about Metemagical Themas before, so I'd be up for this group blog. I have always thought that a base-six world might be kind of interesting to live in. Six days to a "week" six weeks to a "month" and six months to a "year". We'd be in conflict with the lunar and solar cycles but think of the experience we'd all gain with age!